The eight students in Ben Davis High School’s AP Statistics class didn’t have time for senioritis. On Tuesday, their last day of high school ever, the eight college-bound seniors dressed up for a final presentation. 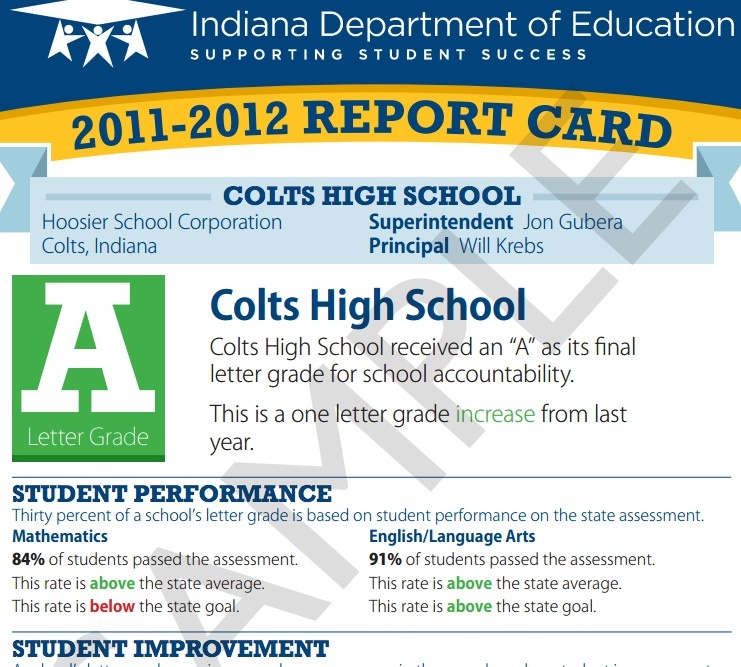 The subject: Indiana’s A-F rating system for schools. For the next step of their assignment — making formal recommendations for how to re-write the A-F model — Butts invited three state lawmakers, including House Education Committee Chair Bob Behning, R-Indianapolis, and a representative for state superintendent Glenda Ritz to the Indianapolis high school to hear their proposals. But while the students’ pitch couldn’t be more timely — the Indiana General Assembly has given state education officials until November to completely re-write the formula — the Ben Davis class is also entering a political fray as complex as the A-F grading system itself. Rep. Karlee Macer, D-Indianapolis, was one of three Indiana lawmakers present to hear the student's proposal for new A-F grading metrics. She, along with Rep. Bob Behning, R-Indianapolis, and Rep. Justin Moed, D-Indianapolis, also offered feedback. In fact, the model’s complexity has become a particular point of contention. Former state superintendent Tony Bennett crafted this model with the intention of including metrics beyond a simple pass-fail rate on statewide tests in a school’s letter grade. However, Ritz has said state officials are at a loss for how to tell schools to improve their grade and prominent state lawmakers have said the grading system is not transparent. But as they told the lawmakers and local school leaders assembled in the high school’s main conference room, the Ben Davis students want state officials to add more complexity to the model. Ferguson and his classmates in teacher John Ulbright’s class drew up recommendations for the high school model, which is different from the model that measures schools where students take the ISTEP+ exams. 30 percent comes from the percentage of tenth graders who’ve passed their English 10 End-of-Course Assessment. 30 percent comes from the school’s four-year graduation rate. 10 percent comes from a “College and Career Readiness” measure. To earn full credit in this area, 25 percent or more of a schools students must earn passing scores on Advanced Placement or International Baccalaureate tests, earn three or more college credits or earn a career certification. Decrease the importance of the End-of-Course Assessments: “There’s a very strong correlation between graduation rates and ECA passing rates, which means there’s a lot of repetition going on in the current model,” student Maddie Holmes says. Between the 60 percent of a high school’s grade attached to the ECA (which students must pass in order to earn a full diploma) and the 30 percent attached to the school’s graduation rate, Holmes says fully 90 percent of the current grading model measures pretty much the same thing — whether students are graduating from high school. Increase the importance of the “College and Career Readiness” metric: Make this component 30 percent of the school’s grade, reducing both ECA portions to 20 percent each. With few reliable ways to track students’ academic growth once they reach high school, the students also recommend state officials find a metric to measure students’ readiness for college when they enter high school and when they exit high school. How that metric changes over a graduating class’s time in school would determine a large portion of the College and Career Readiness metric. The Ben Davis High School AP Statistics class concluded the new A-F rating formula needs to "go beyond easy-to-measure, superficial components" and include new metrics for a school's poverty levels and for student growth in high school. Some lawmakers have argued in a different direction — the current model is too complicated. Adjust the grades for poverty: While the students didn’t say how they wanted to factor socioeconomic status into the final grade, they encouraged state officials to find a way. “This isn’t a fair representation to schools [with high numbers of students on free and reduced price lunch] where there’s great teaching going on, but right now it’s not being accounted for,” student Cole Crouch said. Bring in outside observers to evaluate teachers: “The root of our problem is not our students, it’s our teachers. 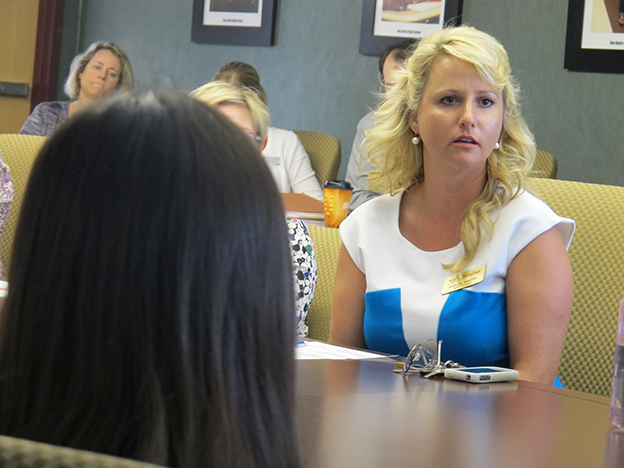 Bringing in outside observers will help improve the quality of feedback to motivate our teachers to try their best,” student Morgan Stovall says. The students also suggested informing students of the grade and of helping school leaders set goals for improving their grade. If you are a school that has higher free and reduced lunch population, the school funding formula will pull in more money for that. We recognize that those students are more difficult to educate. We are trying to, on the other end of that, provide more funding and services for those students so they have greater opportunity for success. I think the state recognizes that’s a problem. The flip side is, if you’re a student in that school, when you graduate, the real world doesn’t change because you were a child of poverty. You go to an employer and they don’t say, ‘I’m on free and reduced lunch’ and make exceptions from you. How do you address what happens once they leave their school? We put together this video explaining how state officials might re-write the A-F grading system — and why. “I don’t think we’re recommending putting it on a curve necessarily,” student Kegan Ferguson responded. He says adding growth measurements to the high school grade would address the students’ concerns. There is one other thing that… I think we need to start using to evaluate effective high schools: what level of remediation is required once you leave. There’s a significant number of students that will walk out of this school, graduate, walk into IU, for instance, and find out I’m not ready to go to IU, I have to start taking remediation courses… We’re talking about significant numbers, we’re not talking about two or three percent. Rep. Karlee Macer, D-Indianapolis, pointed out the state’s budget for testing and remediation — currently about $46 million — is largely spent on testing, not remediation. Ferguson said that wasn’t something the students considered. 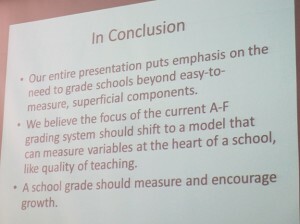 Beyond their potential impacts to a school’s reputation and parents’ school choices, the “A-through-F” grades also mark underperforming schools for state intervention. With so much at stake in the rewrite, many are sure to offer their thoughts on how the new rating formula should look. Butts and teacher John Ulbright intend to submit the students’ full list of recommendations as official public comment during state officials’ rewrite process. The State Board of Education ultimately will have to sign off on a new grading formula by November 15. We have more perspectives on what the new grading formula should look like here.